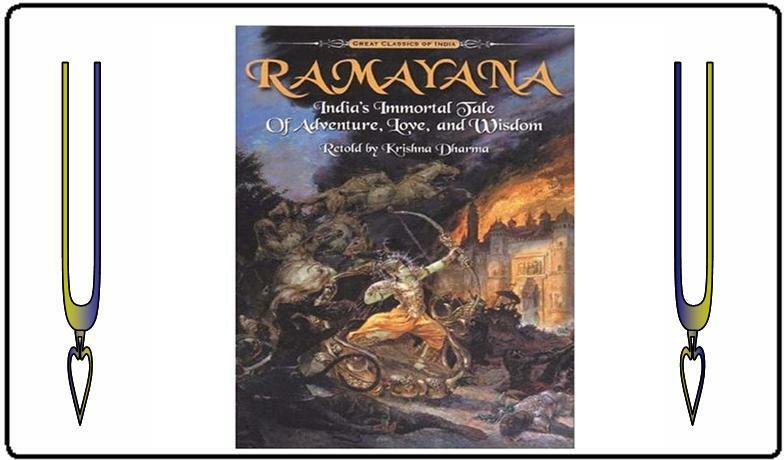 The “Ramayana” is the historical account of the pastimes of Lord Ramacandra, the avatara of the Lord in Treta Yuga. Lord Ramacandra was a unique avatara as He showed the morals and ideals on how to live as a model human being and a model king. Even though there are many Ramayanas written, many of them are not authoritative. The two popular bona fide resources of listening and glorifying Lord Ramacandra’s pastimes is the Ramayana by Sri Valmiki, the original writer of the Ramayana, and the Ninth Canto of the Srimad Bhagavatam. The original Ramayana consists of seven major cantos with an epilogue, which are divided by the major significant portions of Lord Rama’s appearance. This page will give brief overviews of each canto of the Ramayana. Treta Yuga was the second era of the four cyclic cosmic eras. This was when vice was introduced in a predominantly religious population on Earth. Vice began to build up through the king of demons, Ravana. Ravana and the demon population would harass and kill sages, devotees, and seers. When the buildup of sinful and irreligious activities took place, demigods headed by Lord Brahma and Indra sought help of Lord Visnu. Lord Visnu decided to take avatara on earth. Lord Krsna’s quadruple expansions came on Earth in the city of Ayodhya in King Dasaratha’s home. King Dasaratha was the ruler of the Kosala kingdom under the glorious Sun Dynasty with three wives. He was getting old, but he didn’t have any children to continue the Sun Dynasty. Through the blessings of his family priest, Rsi Vasista, and Rsyasringa Muni, four children were to be born to his wives. Lord Vasudeva took form as Lord Rama, who appeared through the womb of Queen Kausalya. Lord Krsna’s Sudarsana disc entered through Queen Kaikeyi’s womb as Bharata. The two youngest sons were through Queen Sumitra giving birth to Lord Ananta Sesa and Pradyumna, also known as Laksmana and Satrughna. Through the family priest, Sage Vasista, the four boys went through gurukula. After spending the recommended amount of years in gurukula, the four boys completed their education and returned to Ayodhya. Upon their arrival, the great Sage Visvamitra requested Maharaja Dasaratha’s help in killing demons Subahu and Marica from destroying their sacrificial fire ceremonies and experimentations. Sage Visvamitra did not need any army; all he needed was Rama. Even though it grieved him, Maharaja Dasaratha gave Rama and Laksmana to Sage Visvamitra. They went to the forests to kill demons, such as Marica, Subahu, and Tadaka, thus protecting the yajna ceremonies. Lord Rama also redeemed Ahilya, the faithful wife of a great sage who was deceived and cursed unfairly. She was cursed to be a stone by her husband due to misunderstanding. Lord Rama’s lotus feet turned the stone back into her beautiful form. During this time, Visvamitra accepted an invitation to visit the town of Mithila; he took Rama and Laksmana with him. King Janaka was announcing the wedding ceremony of his daughter, Sita. Sita was not an ordinary child, for she appeared through the womb of the earth. On a special farming ceremony King Janaka and other sages conducted, a golden box was found. Inside the box was a baby girl whom King Janaka, who took this as a blessing, accepted her as his daughter. In reality, Sita is the form of Laksmi. Since she is no ordinary girl, her husband should not be ordinary. Therefore, King Janaka put a strict test that the warrior who is able to string Lord Siva’s bow will be announced as Sita’s husband. Many great warriors tried to put their strength, but His bow did not budge slightly. Only Lord Rama was able to string the powerful bow and thus be married to Sita. Rama’s brothers found their wives on the same day. As Rama married Sita, Bharata married Mandavi, Laksmana married Urmila, and Srutakirti married Satrughna. With great pomp and show, the citizens of Mithila celebrated this event as much as Ayodhya did. She extracted two boons King Dasaratha gave her. The first wish she had was that instead of Rama, her son Bharata would be Ayodhya’s new king. The second boon she asked for was that Rama would be banished from the kingdom for fourteen years away from any city and living as an ascetic. This pained Dasaratha very much, because the conflict of his fatherly love and his kingly duty was insignificant to being separated from Rama. Lord Rama came to know of the sudden change of plans that were taking place. He accepted his father’s order and immediately renounced the throne. Sita, being a chaste wife, and Laksmana, being a devoted servant and younger brother, came along with Rama to the forest. Dasaratha could not bear to be separated from Rama, and in this separation, he gave up his life. Bharata and Satrughna, at this point, were unaware of such drastic havoc that took place at Ayodhya. When They returned, They learned that Kaikeyi and Manthara instigated this whole plot. Bharata renounced his own birth mother, Kaikeyi, for such a sinful act. Bharata refused to accept the throne, and made it His resolve to have Rama as the sole king of Ayodhya. Bharata, Satrughna, the queen mothers, Minister Sumantra, and Family Priest Vasistha came along to persuade Rama, Sita, and Lakmsana to return back to Ayodhya. Rama, being the model man and the symbol or dharma, refused to return home and said that finishing the remainder of His exile is the duty of not only Rama, but all brothers. Bharata did not have the heart to accept the throne, so He had the slippers that had the dust of the lotus feet of Rama rule Ayodhya. Bharata would administer the state affairs under the guidance of the slippers of the Lord. Bharata, dejected, returned to Ayodhya along with the citizens. Rama, Sita, and Laksmana decided that it would be wiser to dwell into the forest further to the point that no one will be able to trace them. After dwelling for thirteen years going through the forests of India and receiving the blessings of the saints and devotee hermits who have become blessed themselves by seeing the Lord, in His human form, they enter the Dandaka forest. The rsis and other saintly personalities requested Rama to protect them as many demons have been killing them and eating them. Lord Rama made a vow that He will exterminate the world of demons who harass the pious saintly souls. In this way, He along with Laksmana killed many demons including the demon Viragha. In addition, they came across their father’s friend, Jatayu, who is a vulture. Toward the start of their fourteen year, a female demon, named Surpanakha, had become enchanted by Lord Rama’s form. She took a form of a beautiful and persuaded Him to marry her and desert Sita. After Rama refused, Surpanakha tried her luck with Laksmana, but He refused Her, since He told her that marrying him would be maker her a servant. Surpanakha felt insulted by this repeated rejection that she threatened to eat Sita. Laksmana immediately disfigured her by cutting her ears and nose. Surpanakha’s brothers, Khara and Dusana, immediately came and took revenge for their sister’s insult. Rama beheaded all of their armies with a single arrow. Khara and Dusana felt the same fate when Rama silence them with His arrows. Surpanakha went to Lanka and informed her elder brother, who was the king of the demon race, Ravana, of her insult and the slaying of her brothers. Ravana wanted to pay Rama back for such humiliation. Even though Vibhisana, his younger brother, and Mandodari, his wife, advised him to avoid this, Ravana decided to kidnap Sita. Ravana sought the help of his sorcerer uncle, Marica. Marica took form of a golden deer, which enchanted Sita. Sita requested Rama to fetch the deer. Laksmana felt that this deer is a demon in disguise and advised Rama to avoid chasing it. Nevertheless, Rama chased the deer to a great distance. After the deer felt tired, Rama shot an arrow that killed it. Immediately, the dying Marica did his last deed to aid Ravana by yelling “Help Sita! Help Laksmana!” in Rama’s voice. Sita and Laksmana heard this cry. Sita was extremely agitated and worried for Rama’s well being that she spoke some ill and untoward words to Laksmana. Being swayed by Sita’s insuting remarks, Laksmana made an invisible protective line to protect Sita, and left in search of Rama. Ravana, seeing Sita unprotected by Rama or Laksmana, went to Sita’s cottage disguised as a brahmana beggar. The beggar Ravana told Sita that he needed rest and was also hungry. Sita was going inside the cottage to bring some food for the brahmana, but she remembers about the invisible protected line. She requested the brahmana to come to Her and pick it up. The brahmana got very offended and angry and threatened to curse Her that Her husband would be killed by the horns of the dear. Sita, in fear of Her husband’s life, crossed the line and begged for forgiveness. The brahmana forgave her and then started speaking to Sita, describing her beauty in an intimate way. All of a sudden, the brahmana changed back to his original form, Ravana. Ravana captured Sita and he flew off in the air through his aerial car. Sita’s cries of help were not heard by anyone, except for Jatayu. Jatayu, even though he was an old and frail bird, tried to attack Ravana. After a great amount of fighting, Ravana, deceitfully, took his Candrahasa sword and cut Jatayu’s wing while fighting. Jatayu fell on earth and tried to hold onto his life awaiting for the arrival of Rama and Laksmana. Sita took off all of Her jewelry, wrapped in a piece of her sari-cloth, and threw them out praying to the dwellers of nature to inform Rama about Her. Upon all of this happening, Rama was surprised and upset to see Laksmana in the forest, after the killing of Marica. Rama feared that leaving of Sita alone was not a good idea, and immediately ran back to the cottage. They checked lakes, rivers, forests, and were not able to see Sita anywhere. Rama was so covered in grief that He was praying to trees asking where Sita went. On the path, He encountered Jatayu, who was on the verge of dying. Jatayu informed Rama that Sita has been kidnapped by a demon king of Lanka, named Ravana. Jatayu passed away after doing his last service to Lord, whom he thought of as His son. Jatayu, for dying in the service of the Lord, went back to Godhead. Rama received help from materially conditioned demons, and in turn, Rama freed them from their miserable state to their original beautiful states. Rama and Laksmana also visited Sabari, an eldery tribal woman, who spent her entire life in service of her spiritual master, Matanga Muni. Before his departure, he instructed her to worship the lotus feet of Sri Ramacandra. Sabari, being very happy to see Rama and Laksmana, served Them nicely with fruits and flowers. Rama, after instructing her on the nine paths of bhakti, gave her the perfect form of liberation by sending her back to Godhead. Before her liberation, she instructed Rama and Laksmana to visit Mount Rsyamukha and seek alliance of the king of apes and bears, King Sugriva. They will help Rama find His wife. After Sabari’s deliverance, Lord Rama and Laksmana went southbound in search for Mount Rsyamukha for Sugriva and his ministers. As they were entering the nearby territory, some monkey spies found two men with weapons dressed in clothes an ascetic would wear mentioning Sugriva’s name. The monkey spies reported this to their king, Sugriva. Sugriva was worried that these men may be spies of his cruel brother, Vali. Vali was the elder brother of Sugriva who captured Sugriva’s wife and Sugriva’s kingdom, Kiskindha, without any form of justification. Sugriva sent his minister, Hanuman, to see who the two men are. Hanuman, who is originally a form of Lord Siva, was a great devotee of Lord Rama, even though in Treta Yuga, Hanuman never met Rama, personally. Hanuman saw the two men and questioned the identities of the two men. Upon finding out Their true identities, as Rama and Laksmana, Hanuman’s heart was filled with joy, since he finally met His Lord, and grief, that he couldn’t recognize Him. Hanuman carried Rama and Laksmana and welcomed them to Rsyamukha and to King Sugriva and the other monkey and bear ministers. Sugriva and Rama took an oath of friendship, witnessed by a sacred fire. Sugriva vowed to help Lord Rama succeed His mission in rescuing Sita. Lord Rama promised that He would free Sugriva’s wife from Vali, kill Vali, and capture Sugriva’s lost kingdom. To arrange for Vali’s death, Sugriva engaged Vali for a combat in mace warfare. Sugriva’s ministers warned Rama about Vali’s powers, such as Bali acquiring the twice fold opponent’s strength upon combat. Rama hid in the bushes and shot the fatal arrow that took Vali’s life. Vali, after understanding who his killer was, began to understand his sinful life. The dying Vali begged forgiveness from Sugriva, his minister, and surrender to Lord Rama’s feet. Before his passing away, Vali surrendered his son, Angada, and wife, Tara, to Sugriva and Lord Rama. Sugriva was declared the new king of Kiskindha. As the new king, Sugriva had to fulfill two duties, namely establishing order in his kingdom, and fulfilling his vow to Lord Rama. Lord Rama’s mission had to be delays due to the four month season of rain that took place. After the four month season of rain, Lord Rama, Laksmana, Sugriva, Hanuman, king of bears Jambavanta, sons of the demigod of architecture, Nala and Nila, and the worldwide assembly of apes and bears met in discussing a plan on how to track the whereabouts of Sita. Surgiva divided his army to cover the four directions of the world. Lord Rama, felt in His heart, that Hanuman will be successful in this mission, so He entrusted Hanuman with His ring, the ring Sita would recall from Their wedding night. With pomp and joy all four armies set out in search of Sita. Meanwhile, Sita was suffering and was in total agony without Her beloved husband. Ravana and his demoniac guards would constantly torture Her. Her only well wishers were a demon guard, named Trijata, and the immediate family of Ravana’s youngest brother, Vibhisana. They would give Her fruits and other foods in the mode of goodness. She was constantly awaiting the arrival or Lord Rama. Sugriva gave a one month deadline for his army troops to return. The north, west, and east groups have returned unsuccessfully. The south group has not returned yet. The south group, headed by Angada, with Jambavanta, Nala, Nila, and Hanuman, had help from Lord Brahma’s daughter, Svayamprambha, and Jatayu’s older brother, Sampati. Sampati, being a vulture with limitless vision, was able to see Sita at Lanka. Thus, the army was elated to know they were heading the right direction. However, the vast sea separated them from their goal. Hanuman, who had immense powers of growing, shrinking, immense strength, and disguised forms, did not realize of his powers until Jambavanta reminded him. Hanuman, by taking the name of Lord Rama, assumed a gigantic form and flew across the sea. He was encountered by a mountain Mainaka, demons Surasa and Simhika. After killing the demons attacking him, he finally reached Lanka. Before meeting Sita, he found the symbols of Lord Visnu, namely the conchshell symbol, Visnu’s Sudarsana cakra, lotus flower, and the tulasi plant, which is dear to Lord Krsna. He knew this was a Vaisnava devotee, who was trapped in the demoniac kingdom of Ravana. Hanuman met the resident of this house; this resident is the youngest brother of Ravana, Vibhisana. Even though he was a raksasa, as well as the youngest brother of a sinful person, Vibhisana always chanted the name of Lord Rama in hopes to become His devotee and meet Him. Hanuman was overjoyed in meeting a devotee of the Lord. Vibhisana gave whereabouts on where Sita was and how to reach Her. Once the nightfall took place, Hanuman assumed a miniature form and hid in the garden where Sita was laid captive. When everyone was asleep and no one was present, Hanuman sang the glories of Lord Rama and tactfully gave Her the ring Lord Rama gave him. Sita was overjoyed that an envoy of Her beloved husband was there. Sita gave Hanuman her special hair piece Rama has gifted her during Their wedding night. Hanuman was requested by Sita to leave at once and notify Rama. Hanuman decided to access the fortification and layout of Lanka, in order to be prepared for the upcoming war. In the process, Hanuman was caught by the guards, and one of Ravana’s sons, Aksaya Kumara. Hanuman killed the guards and Aksaya Kumara without much effort. Ravana sent his oldest son, Meghanad, to capture Hanuman. Meghanad sent a powerful weapon of Brahma which Hanuman, with great humility to the weapon of Brahma, surrendered to Meghanad. Ravana punished Hanuman that his tail be burnt. While the entire city of Lanka was laughing at Hanuman having his tail burnt, Hanuman immediately broke free and burnt the entire city of Lanka leaving Sita’s garden and Vibhisana’s home unharmed. Hanuman visited Sita once more to seek Her blessings before He goes back to Lord Rama. Lord Rama was so filled with relief and joy that He blessed Hanuman to be His eternal devotee. To Hanuman, that meant more than anything in the world for Him. Without delay, Lord Rama and Laksmana with the help of Sugriva and the ape and bear army set forth to Lanka. With great joy, the army walked all the way down to the sea shore. The same problem that barred the south army before came forth again. Lord Rama had to find a way to cross the ocean with the entire army. After Hanuman’s arrival in Lanka, Vibhisana began to feel his true sense of duty as a devotee of Rama. In the next court meeting regarding the burning of Lanka, Vibhisana pleaded over and over again to his older brother Ravana to return Sita to Lord Rama and surrender to Lord Rama. Ravana was not able to tolerate this form of treason by his younger brother, so he renounced him and forcefully banished Vibhisana out of Lanka. With no place to turn, Vibhisana crossed the ocean to Lord Rama and surrender to Him. Vibhisana was at a loss of words in his heart filled with grief when he met Lord Rama. Even though Vibhisana was a demon by birth and was the enemy’s younger brother, Rama accepted Vibhisana very lovingly, as Vibhisana was a devotee. Rama also promised Vibhisana that after Ravana’s reign of evil and tyranny was over, Vibhisana would be the next successor. The problem of crossing the great sea was still in question. Rama meditated for three days without food or water, and prayed for the sea god, Varuna, to open its passages up for Rama and His army to cross. After three days, Rama saw that the sea god was not obeying His order. Enraged, Lord Rama was about to dry up the sea with a powerful weapon. Out of fear of death, Varuna surrendered to Lord Rama and begged for forgiveness. Varuna suggested that the two ape architects, Nala and Nila, build a bridge out of rocks. Due to a curse by an ascetic, whatever Nala or Nila throw in the water cannot sink. In this manner, the bridge can be made without any issues sinking. The entire army of apes and bears created a very large bridge in which the entire crossed the ocean and reached Lanka. Such news disturbed Ravana and brought more joy to Sita as She realized Her days of misery would soon be over. Many peace proposals on both sides were brought forth, but Ravana would not end up surrendering to Rama. As a result, the war was destined to take place. A five day war brought forth destruction to the side of Lanka. There were only little injuries on the side of Rama, which were all lila of Lord Rama, and Laksmana, who was really Lord Balarama in Treta Yuga. Ravana’s six remaining sons (the seventh was killed by Hanuman in the previous canto), Makraksa, Prahasta, Atikaya, Devantaka, Narantaka, and Meghanad, his middle brother, Kumbhakarna, and other generals of Lanka were all vanquished. The sinful Ravana, who refused to chant the name of Rama, recognized His divine identity after being killed by Rama. Ravana was killed by Lord Rama. Lanka was very excited to the news of their new and righteous king, Vibhisana. Everyone was very eager to free Sita and seek the blessings of Her and take refuge of Her lotus feet. While everyone was organizing a pomp and show celebration, Lord Rama ordered Laksmana to create a fire-pit for Her. Lord Rama wanted Sita to cross the fire before He reaccepts Her. Everyone, including Laksmana, was very shocked to hear this cold-hearted decision of Lord Rama. Lord Rama said that He knew of Ravana’s kidnapping of Sita. Therefore to help Rama and Laksmana out on Their lila, He sent the true form of Sita to the demigod of fire, Agnideva. Agnideva left behind a shadow version of Sita to help Them on Their lila. In reality, Rama and Sita are never separate. If Ravana would have touched the true Sita, Ravana would have been burnt to ashes. Also, according to Vedic culture, it is considered taboo to reaccept a wife who has been away for a long time at another man’s house. Therefore to abide by earthly dharma, to create this lila, and to prove to the world that She is pure, Rama encouraged this fire test. The shadow version of Sita disappeared and the true Sita came back to Rama. In addition, as confirmed by this and other scriptures, the shadow version of was Vedavati, who cursed Ravana that she would be the cause of his death. The exile of Rama, Laksmana, and Sita were almost finished, and they had to get back to Ayodhya as soon as possible, or else Bharata would give up His life. Vibhisana arranged for Ravana’s aerial car, so that the entire army of apes and bears, Sugriva, Jambavanta, Hanuman, Nala, Nila, Angada, and the associates of Lord Rama who helped Him and served Him throughout His exile can come to Ayodhya. The aerial car came to Ayodhya’s front gate, where the three queen mothers, Bharata, Satrughna, their wives, Laksmana’s wife (Urmila), Sage Vasista, Sumantra, and the citizens of Ayodhya can behold the return of Their dearest Lordships and Their devotees. Everyone was greeted whole-heartedly, and Rama, Laksmana, and Sita were dressed in royal clothing again. Rama and Sita were declared and anointed as the new king and queen of Ayodhya. This celebration was filled with pomp and show, and the citizens were all elated in Lord Rama’s rule of dharma, known as rama-rajya. The highest standards of dharma were enforced and the highest form of true justice was given by Lord Rama. By His grace, no illness or the signs of material suffering took place. All citizens were truly happy in the kingdom of Lord Ramacandra. During His rule, Lord Rama overheard rumors by His citizens of how they doubted Sita’s purity, as she stayed in Lanka for ten months. Lord Rama was deeply angry as well as upset at hearing offenses to His dear consort. As a husband, he wanted to abdicate the throne and leave for the forest with Her. However, His kingly dharma forbidden Him to do so, so He ordered Sita’s renunciation in the forest. Laksmana was ordered by Rama to send Her so far into the forest that She will not be able to return to Ayodhya. Sita, who was pregnant at the time with Lord Rama’s twins, was very much hurt by accusations, but was willing to obey the desires of Her beloved Lord. Sage Valmiki saw Sita crying and alone. By his ability to see the past, present, future, and know of all the happenings that take place, he understood what happened and knew of the purity of Sita. He allowed her to stay at his women’s asram. Sita, who changed Her name to Vanadevi (forest goddess) to remain incognito, would help serve the saintly mothers and associate with the devotees at the asram. In due course of time, She gave birth to two beautiful twins, Lava and Kusa. They looked very much like Their dear father, Lord Rama. Rama was dealing with the pangs of separation. He was so faithful to Her that He sleeps on the ground and never considered to marry again. About twelve years passed on and Lord Ramacandra, inspired by His family priest Sage Vasista, decided to conduct a horse-sacrifice ceremony. He invited all of the kings to attend this grand ceremony. Even though this ceremony needed a wife, Lord Rama had a golden statue of Sita especially made to accompany Him. The horse sacrifice ceremony consisted of the horse freely going in all directions of India. Whoever bowed to the horse would receive protection of Rama, while though who challenged the horse will have to fight Lord Rama in war. When the horse comes back victorious, then the sacrifice is complete. On one of the latter days, the horse happened to reach the asram of Sage Valmiki. Lava and Kusa, who was trained in all arts and sciences by Sage Valmiki, saw this horse and decided to capture the horse. Satrughna saw that two boys stole the horse and decided to attack them. Lava and Kusa threw a weapon to make Him unconscious. Laksmana came and tried His best, but Lava and Kusa put Him to sleep. Bharata, Sugriva, and Hanuman were the next up to subdue the boys. Due to his great devotion to Lord Rama, Hanuman realized they are the children of Rama and Sita. Hanuman subdued himself to them. Bharata and Sugriva, both, were attacked and became unconscious by Lava and Kusa. Finally, Lord Rama came to attack Lava and Kusa. Before a war could take place, Sage Valmiki stopped this war and Lava and Kusa begged for forgiveness. Neither did Rama, Lava, nor Kusa realize what their relationship to each other was that day. Valmiki and Sita disclosed the truth about who She is, who Rama is, and their relationship to Lava and Kusa. The boys felt very guilty for their actions and decided to sing to Ayodhya’s people about their offenses they have committed towards Their queen, Sita. They also went to Rama to beg for forgiveness. Rama invited the boys to sing the Ramayana every night to Rama’s assembly of kings and guests every night. Through their singing, Rama realized that Sita was alive under the shelter of Sage Valmiki, and Lava and Kusa are the Rama’s sons. Again, Rama’s fatherly emotions to embrace the children and Rama’s kingly duty to ask for proof are again in question. Rama requested that Sita give proof to clear Her name once and for all, even though He knew very well that She was pure. Sita, always willing to obey the orders of Her Lord, came. She offered obeisances to all of Her elders and was about to give Her proof. She requested that if she truly was pure, thought of no other man than Lord Rama as Her husband, and did not desire anything other than His lotus feet, then the mother earth should reaccepted Her. Immediately, the earth split into two sections and took Sita inside her. Sita left the world and everyone was upset. Lord Rama threatened that if the earth didn’t open up, He’ll create a powerful deluge and destroy the earth. Brahma, in order to pacify Rama, reminded Him that He is Lord Vasudeva. She went to His eternal abode. After Rama finishes His pastimes, He will surely meet Her again. Lord Rama reaccepted Lava and Kusa with great love. Lord Ramacandra ruled for the remainder of Treta Yuga. He divided His kingdom for the sons of Laksmana, Bharata, Satrughna, and His own. He completed many sacrifices as expected for a king, and He made the highest standards of dharma on earth. One day, a sage came to Lord Rama and requested a meeting with Him that must be highly confidential. Rama must vow that anyone who listens or sees this conversation should be sentenced to death. Lord Rama enforced this order and it was Laksmana’s duty to make sure no one enters the room. The sage was, in actuality, Yamaraja, the demigod of death. Yamaraja informed Lord Rama that His duties for His avatara have been completed and He may return back to His abode. Even though Lord Rama acted as a human in His entire lila, this is one of the very few points where Lord Rama displays His divinity. He summoned Yamaraja to come, which is why He came. Rama agreed to return back home after finishing a few more tasks. At this point, Durvasa Muni came to Laksmana and requested to see Lord Rama angrily. Laksmana politely refused, as Rama was busy at the moment. Durvasa Muni was very enraged that he was ready to curse Ayodhya and the entire clan of Raghus. Laksmana, being Lord Ananta Sesa, knew that this was an arrangement for Him to return home. So He willingly broke Lord Rama’s order. Lord Rama had no choice but to sentence Him to death. Hanuman suggested renouncing Him would be better than a death sentencing, as per the scriptures; they are virtually the same end result. Lord Rama renounced His brother, who served His lotus feet His entire life. Laksmana went to the ocean and changed form back to His original form, Ananta Sesa. He went back to His original home in Vaikuntha, where He was greeted by all celestial beings. Lord Rama was ready to go back to His divine abode. Before leaving, His citizens and devotees wanted to come with Him too. Lord Rama was very merciful to His devotees that He allowed them to come with Him too. He requested Vibhisana to stay on earth and practice the worship of Lord Jagannatha Rama until the end of Treta Yuga. He requested Jambavanta to stay on Dvapara Yuga, and Hanuman to stay on earth until Kali Yuga to preach Harinama Sankirtana with the glories of Lord Rama. Hanuman took form much later as Murari Gupta, who glorified Lord Caitanya. Lord Rama changed His form. Bharata and Satrughna changed to Their respective forms, and everyone else gave up Their bodies to return with Lord Rama and never return back to the world of birth and death. All Glories to Sri Sri Sita Rama Laksmana Hanuman!